Why would I need self storage in Memphis, TN? There are a variety of reasons why you might need self-storage in Memphis, TN. How much is a storage unit in Memphis, TN? The cheapest storage unit in Memphis, TN is $28.00 per month. What size storage units do you have available in Memphis, TN? In Memphis, TN we have sizes that range from 5'x5' to 10'x30' to suit your storage needs. How much is it for a 5'x5' storage unit in Memphis, TN? The cheapest 5'x5' storage unit in Memphis, TN is $40.00 per month. Memphis, Tennessee, is one of America's most expansive cities, stretching over 300 square miles. It's long been known as one of the most dynamic music scenes in the South, with a rich history that includes iconic greats Elvis Presley, Aretha Franklin, Johnny Cash and B.B. King. Memphis is also famous for its legendary barbecue and is home to the World Championship Barbecue Cooking Contest, which attracts tens of thousands of guests every year. The Memphis economy benefits from its central geographic location, making it an ideal city for shipping, transportation and commerce. In addition to a busy economy, Memphis offers a moderate climate, an affordable cost of living and a number of local parks and attractions. Memphis was founded in 1819 by a group of affluent Americans, including future president Andrew Jackson. It quickly established a flourishing plantation economy, producing cotton, hardwood and several other agricultural products. The early 1900s brought about much change in the city, with city planners developing a revolutionary sewer system, public water system and many parks that you can still visit today. During the civil rights movement, Memphis took center stage as the site of many important events. Since then, Memphis has grown and changed many times over, evolving into the modern metropolis it's known as today. Several large corporations are headquartered in Memphis, including FedEx, International Paper and AutoZone. These three companies alone employ thousands of people in Memphis, providing a wide variety of professional jobs. Other large employers in the area include St. Jude's Children's Research Hospital and conservation organization Ducks Unlimited. The largest industries in Memphis are trade and transportation, professional and business services, education and health services. If you're going to be joining the job market in Memphis, you'll find plenty of opportunity in the city's fastest-growing industries: finance, construction, trade and transportation. The Cooper-Young neighborhood is an eclectic area with a diverse population and many 1920s bungalows lining its streets. The Cooper-Young Trestle, a massive steel sculpture depicting miniature replicas of actual homes in the area, marks its entrance. 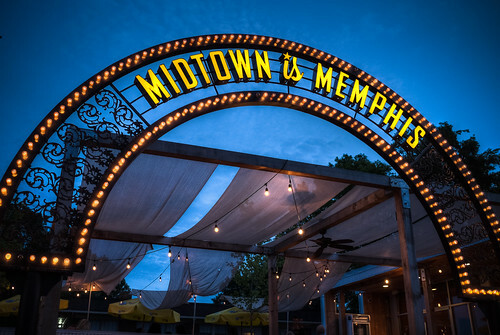 Founded on the live-work principles of new urbanism, Harbor Town on Mud Island is a unique community that attracts a mix of people. It's designed to be very pedestrian-friendly, with many loft apartments located just a few floors above trendy boutiques and restaurants. For many years, Crosstown was centered on a massive vacant building that formerly housed the headquarters of Sears Crosstown. However, now that the building is being transformed into a complex for medicine, arts and education, an active arts scene has arrived in the neighborhood, bringing with it a variety of unique businesses and restaurants. South Main has an active arts, entertainment and nightlife scene, and many old warehouses in the neighborhood are being converted into hip loft apartments. Once a month, the neighborhood hosts South Main Trolley Night, when you can enjoy public parties and free admission to local galleries. Shelby County Schools manages public schools in Memphis, including elementary, middle and high schools. The district also offers charter and career-focused schools. The district also offers charter and career-focused schools. If you're planning to send your child to private school, there are several elementary and college-prep schools to choose from. Most private institutions in Memphis are faith-based schools, but there are a handful of secular options. Utilities: Memphis Light, Gas and Water Division provides all main utilities in the city. Garbage and Recycling: Waste Connections Memphis manages weekly collection of trash and recyclables. Transportation: The Memphis Area Transit Authority (MATA) has bus routes in and around the city, and Memphis has worked to make the downtown area more bike-friendly. There's also a city-wide car-sharing program. As a relatively large city, Memphis has a large variety of neighborhoods, most of which have a median home price that's dramatically below the national average. You'll have a wide range of housing options, from single-family homes to large, multi-family developments, all at a very affordable price. Our lowest priced units in Memphis, TN average $81.44 per month. 529 people have reserved units in Memphis, TN in the past 30 days. There are 9 locations within Memphis, TN's city limits. There are 8 locations in Memphis, TN that offer AC and Heating features.